.How are the Glaciers formed? How are the Glaciers formed? This is an easy forest walk that will lead you to Lake Wombat, a bush enclosed tarn at the foot of Alex Knob. This is a kettle lake that was formed over 9,000 years ago when the Franz Josef Glacier/Ka Roimata o Hine Hukatere retreated. A large chunk of ice was left to melt into the hollow of the landscape and form this peaceful lake. The track is a leisurely 1 hour 30 minutes return. 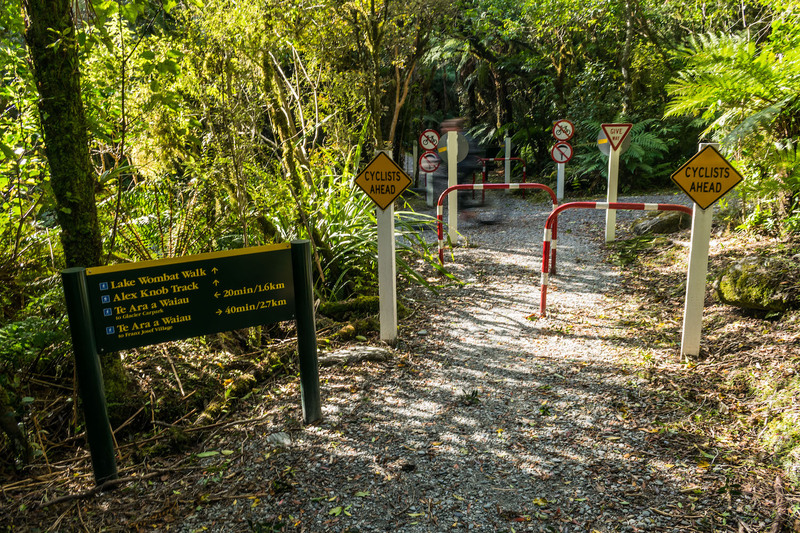 To get to the trailhead drive or walk south from the Franz Josef Glacier Village across the Waiho River Bridge and turn left up the Glacier Access Road. Continue for two kilometres to the car park on your right. Here you will find the trailhead for Alex Knob and Lake Wombat. If you do not have a vehicle you can also catch a shuttle or cycle to the car park. The Lake Wombat Track takes you through the shrubby entanglement of a podocarp hardwood forest. The track climbs gently from the Franz Josef Glacier Access Road and follows the spine of a glacial moraine. The moraine was originally a pile of debris that was left by the surging glacier. 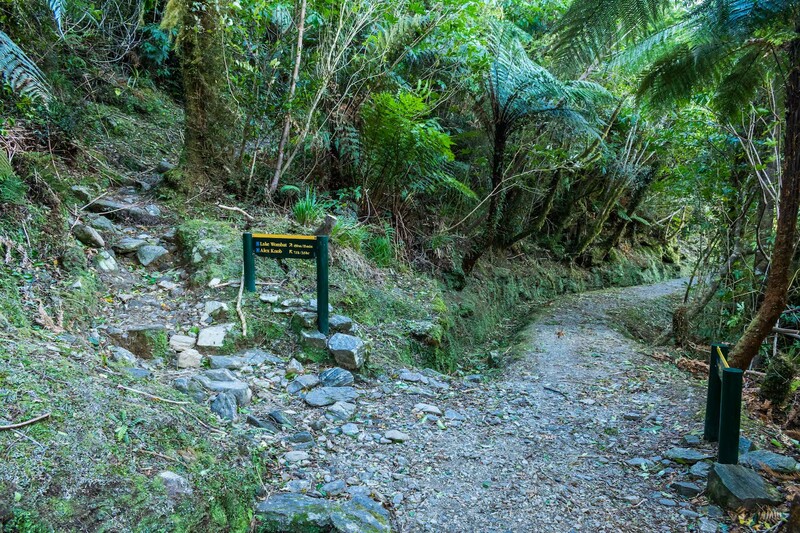 Walk past the Alex Knob track junction, you will head down into a small gully before climbing again to the Lake. Here a park bench is conveniently located so you can sit and contemplate the peaceful surrounds. Bellbird, tui, grey warbler, fantail, kea, New Zealand pigeon (kereru), and rifleman can be seen and heard. While on the lake look out for the grey and paradise duck. To find out more about the avian life in the area take a look at www.birdingwestcoast.co.nz. Wombat Jack’s real name was Jack Irwin. He was one of the original prospectors in Glacier Country engaged in the relentless hunt for gold in the late 1800’s. He sluiced for gold using a cradle, shovel and gold pan and despite his back-breaking endeavours never made a fortune. Jack was known for his colourful language and his hospitality. Anyone who was stuck on the southern bank of a swollen Waiho River was welcome to stay at his hut for the night. Alec Graham sampled his ‘most excellent homemade bread’ on more than one occasion. He was a good friend of both the Graham brothers, who built the Graham Hotel and ran the local guiding operations. There are old photographs of him on the Waiho flats with Alec Graham, Tom Seddon (the son of Richard Seddon the Premier), and Jim Nesbitt. For more info including detailed guides, personal locator beacons, weather updates etc, visit the Department of Conservation Visitor Centre in the Franz Josef Glacier township. Check out the DOC web site for more info on all things outdoor. Website & Hosting by BECK & CAUL.